There?s an 85 percent chance you have ESP abilities. Doctor Chris Roe places earphones over a woman?s head. He then slices a ping-pong ball in half, tapes a piece over each eye, switches on a red light, and leaves the room. The woman smiles as images of a location flow through her mind. She sees trees and a stream full of boulders. Standing on one boulder is her friend Jack. She describes the scene in detail to Roe. Half a mile away Jack is standing on a boulder in a small stream. The woman saw him in her mind’s eye. Roe, a psychologist at the University of Northampton, says 85% of us are clairvoyant. “Our results are significant,” Roe says. “ESP should be taken seriously.” He believes with minimum training anyone can develop ESP. A guided relaxation session spoken by Dr. Jill. Sets the stage for ESP experiences. Brainwave sessions that prepare your mind to enter limitless deeper mental states like Theta and Delta. Natural music engineered to produce deep Theta/Delta brainwaves for ESP consciousness and deeper levels of psychic insight. 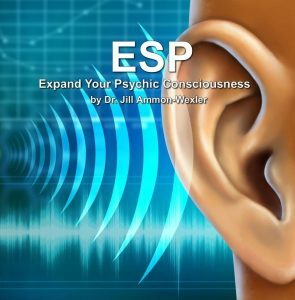 Drops you into brain frequencies that encourage both ESP and deeper states of personal awareness. Procedures for the creation of Future Memories are included in a chapter of this latest downloadable book by Dr, Jill Ammon-Wexler.